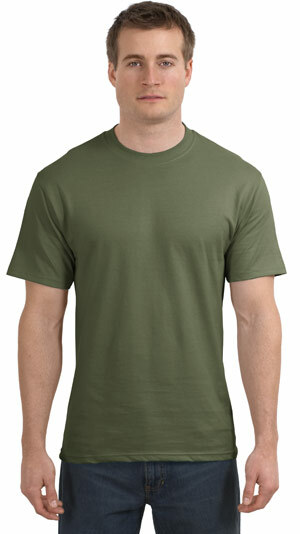 | 6.1-ounce, 100% ring spun cotton (preshrunk) Tagless label Double-needle coverseamed crewneck Lay-flat collar Shoulder-to-shoulder taping Double-needle sleeves and hem Hanes EasyColor program, haneseasycolor.com Ash is 99/1 cotton/poly. Light Steel is 90/10 cotton/poly. Oxford Grey and Charcoal Heather is 60/40 cotton/poly.